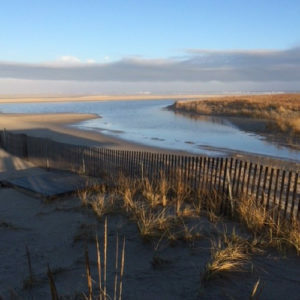 At least three to five times a week we get on our bikes and ride down to Jones Beach to walk on the beautiful boardwalk. This exercise may very well be our favorite activity. 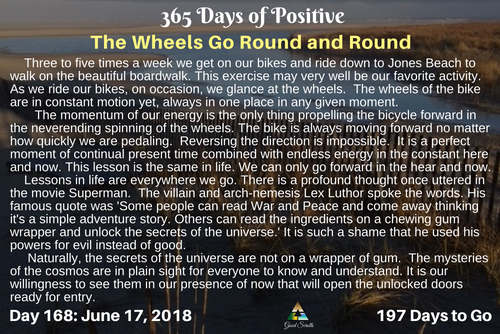 As we ride our bikes, on occasion, we glance at the wheels. The wheels of the bike are in constant motion yet, always in one place in any given moment. The momentum of our energy is the only thing propelling the bicycle forward in the neverending spinning of the wheels. The bike is always moving forward no matter how quickly we are pedaling. Reversing the direction is impossible. It is a perfect moment of continual present time combined with endless energy in the constant here and now. This lesson is the same in life. We can only go forward in the hear and now. Open eyes are where the lessons flow. Lessons in life are everywhere we go. There is a profound thought once uttered in a movie called Superman. The villain and arch-nemesis Lex Luthor spoke the words. His famous quote was ‘Some people can read War and Peace and come away thinking it’s a simple adventure story. Others can read the ingredients on a chewing gum wrapper and unlock the secrets of the universe.’ It is such a shame that he used his powers for evil instead of good. Naturally, the secrets of the universe are not on a wrapper of gum. The mysteries of the cosmos are in plain sight for everyone to know and understand. It is our willingness to see them in our presence of now that will open the unlocked doors ready for entry. We learn the best lessons in amazement of all the magic that surrounds us.